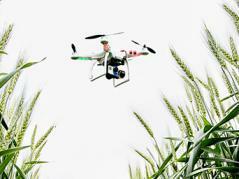 URBANA, Ill. – Unmanned aerial vehicles (UAV) and other robotic vehicles are no longer seen as toys for hobbyists, but are becoming an important tool for the future of agriculture. But many people still have questions about the safety of drones, about how farmers are using UAV on their farms, and what kinds of regulations exist in order to use these new technologies. Dennis Bowman, a University of Illinois Extension educator and expert in agricultural technologies, including drones, explains that there is much interest from agriculturalists in UAV technology because of the opportunity to see a “bigger picture” of what’s going on in their fields. Although crop scouts may be able to see problems while walking through acres of corn early in the season, it becomes more difficult to detect problems across the field later in the season. “When the corn is up over your head, it’s hard to see what’s going on throughout the entire field. The opportunity to get this picture from the air, to be able to see what’s going on at the far end of a 120-acre field that’s not easily visible from the road, you can do a better job of seeing all the things that might be going on,” he says. He adds that drone technology is already allowing farmers to see areas of the field showing problems such as nitrogen deficiencies, weed problems and the extent of the problems, and impacts of drainage issues in a field. “All of these are in these aerial images. Documenting things that happen during the year, a historical perspective of the crop development throughout the season, we can add to the data set. Recently, Bowman along with Girish Chowdhary, assistant professor in the Department of Agricultural and Biological Engineering at U of I and expert in field-robotics and unmanned aerial systems (UAS) shared some of the advances and limitations of robotic vehicles in agriculture during a one-hour live Twitter chat and podcast. Chowdhary says the next frontier of UAV and UAS technology is ground robots and drones working together to tackle problems in fields such as weeding, fertilizing, or sampling the plants. Hear more from Bowman and Chowdhary on what’s next for drone and robotic technology in agriculture, as well as changes to FAA regulations for drone operators, in the podcast at http://go.illinois.edu/drones.